The weather here in Washington has been fairly indecisive this autumn. On Monday afternoon, it was about 65 degrees and sunny; on Tuesday, the air was arctic. 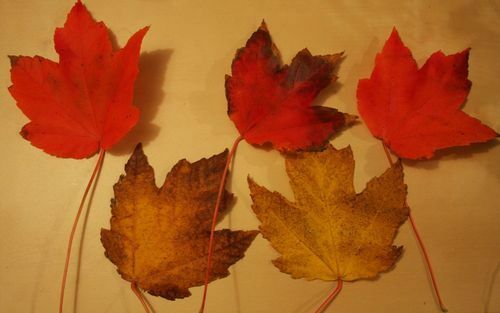 Luckily, all of this atmospheric flip-flopping has, after turning all the leaves vibrant yellow, orange and red, kept them on the trees for a little bit longer than expected. When the city is alive with fall colors, nothing beats a long walk through a historic neighborhood. This week’s post is inspired by a stroll through Capitol Hill, where every other tree is buttery yellow or burnt orange, and it seems like chrysanthemums are in full bloom in everyone’s yard. 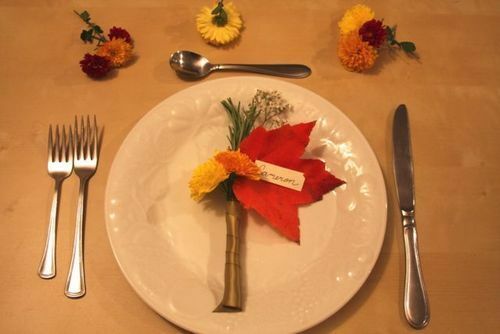 Now that Thanksgiving is just a week away, it’s time to start thinking about place settings. With all the cooking that awaits us in the week ahead, we admit it can be tempting to let things like name card settings fall by the wayside. Resist! Those little touches can make the difference between a lovely table and a magical one. 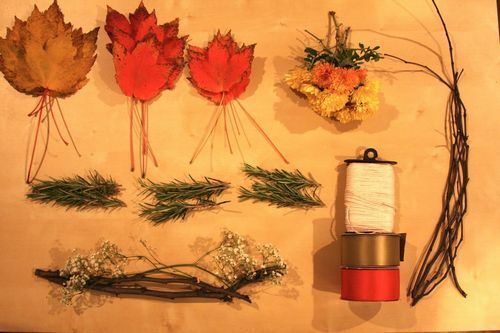 Autumn leaves, freshly picked mums (orange, yellow, or red), fresh rosemary sprigs, baby’s breath, small branches, old business cards, satin ribbon, floral wire, scissors, glue dots and twine. 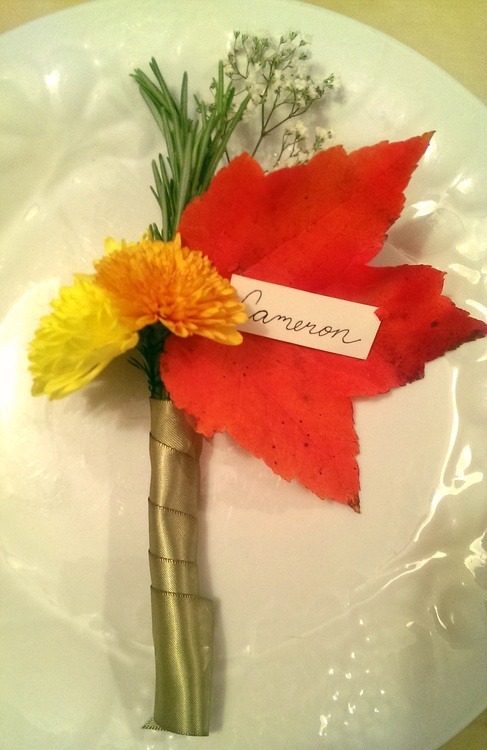 First, pick the leaf that will become the base of your place setting. 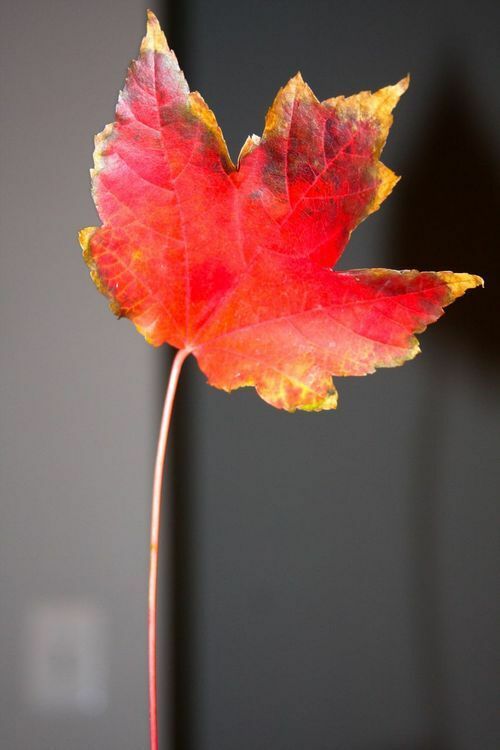 Look for a leaf with a slight angle to the right or left. 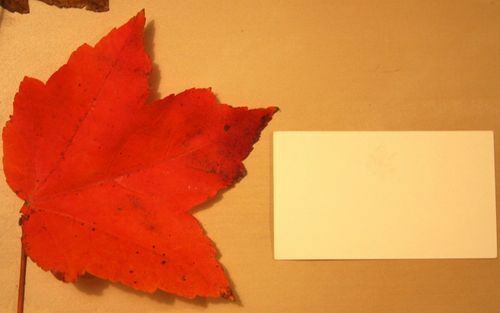 Next, measure your business card against the size of the leaf so you have an idea of how much card will fit onto your leaf “canvas”. 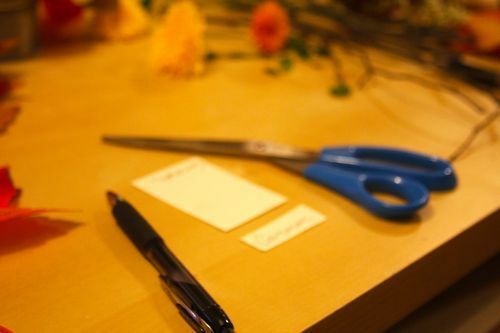 Write the name of your guest on the bottom of the back of your business card, and cut out the rectangle around it. 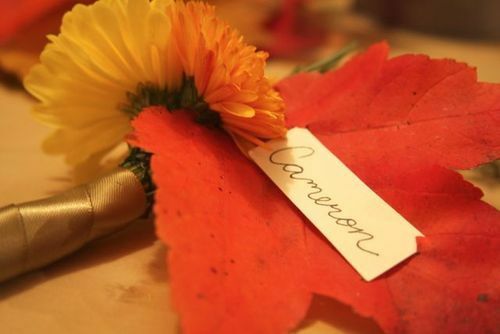 Create diagonal slits in the leaf at the corners of your name card so the card fits snugly into the leaf, then set the card aside. 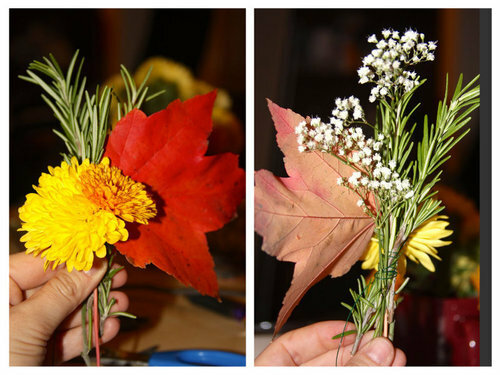 Set the leaf aside, and gather a couple of your mums. Bind them together with floral wire. Bind the mum bundle to your leaf, and insert 2-3 sprigs of fresh rosemary behind them for balance. Then place a piece of baby’s breath next to the rosemary to give your arrangement some height and depth. Wire the baby’s breath to the existing stems. You now have the foundation of your name card setting! Time to stabilize it–this is where the small branch comes in. Place the branch behind the entire arrangement. 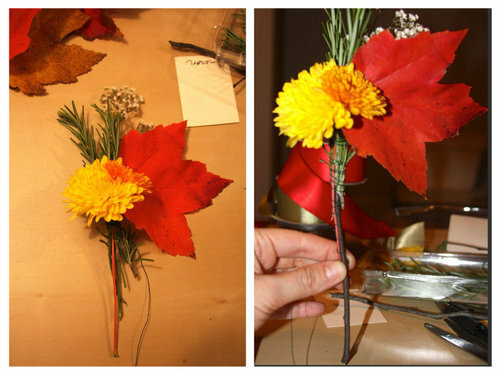 The top of the branch should line up with the bottom of the mum flower and extend downward approximately the length measured from the bottom of the leaf to the top of the baby’s breath. Attach with floral wire. Next, wrap the base of the arrangement with satin ribbon and secure with glue dots at the top and bottom. Slide your name card into the diagonal slits you made in the first steps. 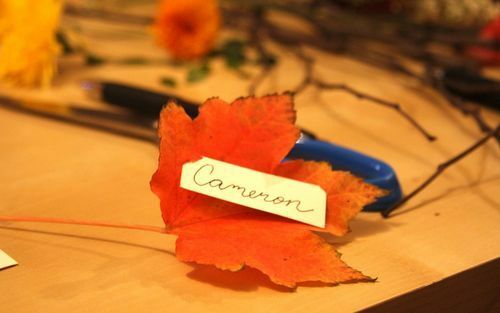 Rest each name card holder on a charger. Now your guests will know where to sit, and you can focus on the turkey thermometer. 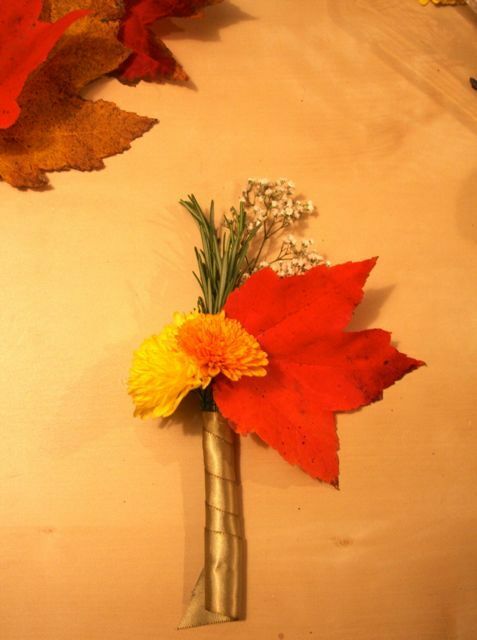 All of us at Bloompop wish you a very happy Thanksgiving! We’re thankful for each and every one of you, and we’d love to see how you’re setting your table this holiday. 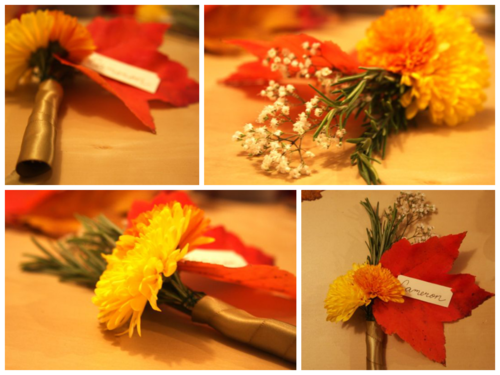 Mention us on Twitter, Facebook or Instagram with a photo of your flower-inspired Thanksgiving table, and we’ll give thanks with 20% off your first Bloompop order. 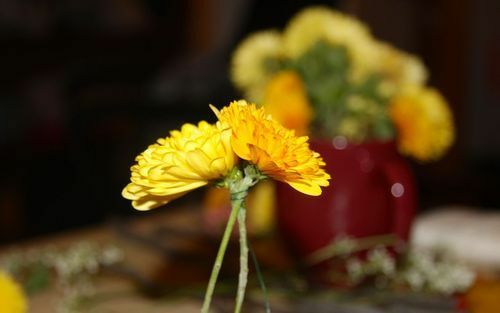 If you’re still in need of a gorgeous centerpiece, check out the local, artisanal floral designs on Bloompop.com.